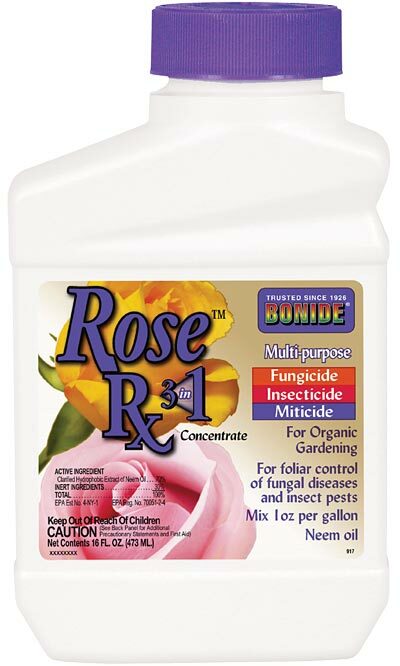 Protect the leaves of your roses, houseplants, flowers, trees, and shrubs from fungal disease, mites, and insect pests with Bonide Organic Rose Rx 3-in-1 Neem Oil Concentrate. This multi-purpose spray controls eggs, larvae, and adult insects such as aphids, spider mites, scale, whiteflies, beetles, and leafrollers and is most effective when used every 7 to 14 days. This treatment is also an effective fungicide for the prevention and control of various fungal diseases including powdery mildew, black spot, downy mildew, anthracnose, rust, leaf spot, botrytis, needle rust, scab and flower, twig, tip blight, and alternaria. Because these diseases are very difficult to eliminate once they appear, prevention is the best form of defense. Simply apply this liquid treatment on a 7 to 14 day schedule until the potential for disease development is no longer present. To control diseases already present, apply on a 7 day schedule until the disease is eliminated. Continue to treat on a 14 day schedule to prevent the disease from reoccurring. To prevent rust leaf spot disease, anthracnose and scab, begin applications at the first sign of spring budding. To prevent powdery mildew, apply in mid-summer or when disease is first detected, continuing to treat until disease no longer exists. Shield your favorite plants and flowers from fungus, mite, and insect damage with Bonide Organic Rose Rx 3-in-1 Neem Oil Concentrate. Made in the USA. Note: This product is toxic to bees exposed to direct treatment - do not apply while bees are actively visiting the treatment area. Bonide Captain Jack's Dead Bug Brew, Concentrate, 16 oz. Bonide Bacillus Thuringiensis Insecticide Conc., 16 oz. Bonide Liquid Pyrethrins Spray Concentrate, 16 oz.